I happened to be watching the animated film, Frozen, when it occurred to me that the reindeer, Sven, reminded me very much of my Appaloosa gelding, Spider. I had been contemplating what to do for this year's Halloween competitions and the idea unfolded. The costume is completely designed and created by myself. I made a body sheet of brown fleece, cut out a mask of longer white fur that I trimmed with a clippers to a shorter nap around the face, and built up the higher withers out of upholstery foam which I then covered in long white fur. The hooves are made of felt. I was able to get a general shape for the part that covered his hooves by using a bell boot as a pattern piece. The antlers have a wire armature welded to a metal crown that is secured to his leather bridle, the armature is covered in quilt batting and a cover of muslin. My dress is adapted from a Burda sewing pattern. The colorful decorations on the skirt and bodice are appliqués of felt. I purchased the wig and Olaf stuffed animal to complete the look. Oh, and the googly eyes were purchased as well. Every costume is better with googly eyes! As I have constructed this costume over the past three months, I don't have a solid total for the money spent creating it. All of the fabric was purchased on sale or with coupons. I estimate I invested about $150 to put this costume together. For me, constructing the costume is a great creative challenge and provides me with an escape from the stresses that every day life presents, so it is a good $150 spent. We made our debut at the local Backcountry Horsemen's Halloween Trail ride. The costume was a great hit! We felt like movie stars being ambushed by paparazzi, everyone wanted to take our photo. My gelding was a true champion through it all and carried the antlers like they had grown out of his head. He is no stranger to Halloween contests and, just as previously, he took everything in stride. We won our class and my boy took home a new bridle for his wardrobe. Comments for Do You Wanna Build a Snowman? AWESOME I LOVE UR HORSE ALREADY! SO SORRY TO HEAR HE DIED. YOU WILL NEVER FORGET HIM THOUGH RIGHT? KEEP UP THE GREAT WORK! Amazing job! I love Frozen! its awesome!!! I ove it!! Kris, you and Spider look great! What a wonderful horse to partner with you in the fun! What a great idea! One of the best costumes i've seen. The detail on the antlers is amazing. Good job! Kristen is always very creative. Great costume. Beautiful lady w/ a beautiful horse!!!! Yes, I wanna build a snowman! You are always the winner in my book Kris! You did an amazing job. You're very talented. What an amazing duo. The talent, creativeness and trust is certainly in evidence in this picture. The talent to create this costume and the trust of the mighty steed to wear it is truly amazing. Kudos to you and Spider. You did an amazing job on the costume. I envision this kind of thing, but haven't had the nerve to do it. You are very creative and spider did wear it well. What a team. I feel for you for the loss of Spider, I pray for you for strength and I pray for Spiders blessings in Heaven. He deserves the best. What a beautiful tribute to your sweet and adorable Spider. Both of you look precious. Perhaps someone can create a story book and movie about you and the love you had for Spider. that is some amazing sewing skills, and a trusting horse. Your costume is amazing. Your horse standing still for it is a great tribute to your bond with him. The best ever! as usual, soo creative! Spider, you made the BEST reindeer I have ever seen! You were the BEST at being everything Kris needed you to be. Have fun running at Rainbow Bridge! Great costume idea turned out wonderful!! your costume is the best costume I've ever seen! You are extremely talented and creative. Spider is a champ for wearing Sven, and he wears it so well. It saddens me to know it was his last hoorah with you. RIP Spider, you will be missed! What I like about this is that it's great on many levels -- it's not just great in one way, it's great all over. 2. 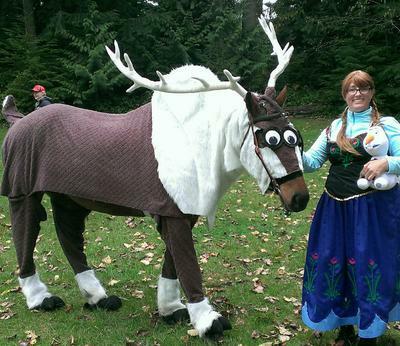 The imagination used in converting a horse to a reindeer - awesome. 3. The execution is fantastic. From just the photo you can see the creativity in the design, but from the narrative that the owner wrote, you can see the creativity in the implementation too -- sometimes the raw material was adapted (e.g. shaving the mask), some was re-purposed (her dress), and overall there was creativity and resourcefulness in it's execution. 4. The horse's demeanor. As the owner describes, this animal has been through the costume ritual before, and took this particular costume in stride. What a GREAT costume!!! And YES! It makes me want to build a snowman!!!!! Not an ordinary costume. Kuddos for the time, effort and thought into on of the most amazing costumes that I have seen. The bond between a horse and rider when they have that connection is much like that of a mother and child. You can see the bond between these two and know the love is strong. Love the costume, Love the devotion. What a great costume for an equally wonderful horse! All of the work you put into it shows, how creative! My toddler would love to have seen you both in person, she probably would have freaked out. Quite the costume, for both of you. I love this costume. It is a testament to the trust this horse has in his person....not many would submit willingly to those antlers! What a wonderful pair. Such a great idea and very well put together! Very clever! Thank you so much for entering.